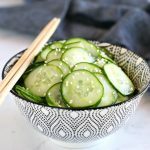 This Easy Asian Cucumber Salad is the easiest lunch idea that's so refreshing! Make it in minutes and store it in a mason jar for quick and easy lunch prep! Thinly slice the cucumber using a mandoline if you have one. If not, simply slice by hand as thin as you can using a sharp kitchen knife. Add the cucumber slices to a large mason jar. Pour the rice vinegar, sesame oil, sea salt and sesame seeds into the mason jar. Place the lid on tightly and shake well to combine. Enjoy immediately or place in the fridge to enjoy up to 2 days later.